Manholes are specified for sanitary sewers and storm sewers at pipe intersections and at locations necessary to provide access to the sewer. Other requirements for manholes in sanitary and storm sewers are given in Hydraulic Analysis. Manholes are not installed in traffic lanes if such an installation can be avoided. Precast concrete manholes are specified in the plans unless special conditions require cast in place concrete manholes. When precast manholes are specified in a contract, the contractor will be permitted to substitute cast in place manholes. Details for each type are shown in the standard plans. The standard manhole will accommodate pipes up to and including 48 in. in diameter. Larger pipes require special manhole designs. 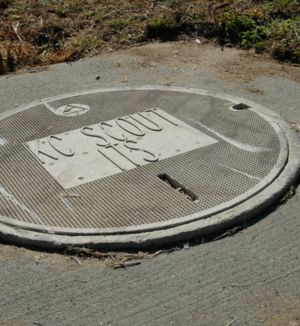 Concrete manholes are used in storm sewer systems. Concrete manholes are used in sanitary sewers, except where local ordinances require brick manholes. Measurement and payment and 2B sheets for precast manholes will be the same as precast concrete drop inlets (see Precast Reinforced Concrete Manholes and Drop Inlets). Brick manhole details are shown on standard plans. 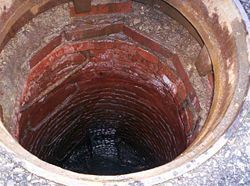 Brick manholes are used in sanitary sewers where required by local ordinances. Brick masonry is used to adjust existing manholes in accordance with the details shown on standard plans. All manholes, whether concrete or brick, require a manhole frame and cover as detailed on standard plans. 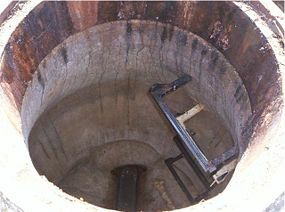 The frame and cover is tabulated on the plans with the manhole, indicating the type of cover required. A frame with a locking cover is specified when a manhole is located in a pavement area. The plans show the location, size, and depth of concrete manholes. The size of a precast manhole is the maximum diameter section required. The plans show the location, size, and depth of brick manholes, and the depth of the foul water drop where required. The plans also show the number and type of manhole frames and covers required. Manhole wall thickness is to be 1/12th of the diameter. So a 48 in. manhole needs a 4 in. thick wall. Is to be not less than 0.0025 times the inside diameter, in inches. Is to have a center-to-center spacing of not more than 6 in. Is to be increased of the depth is greater than 20 ft., as per Std. Plan 731.00. If one layer, is to be placed in the center 1/3rd of the wall. If two layers, is to have a minimum 1 in. cover on each side of the wall. The circumfirential reinforcement shall be continuous. Non-welded splices shall be lapped 20 diameters for deformed bars and 40 diameters for plain bars or wire. Is to have sufficient spacers to hold the cage in place. This page was last modified on 28 September 2018, at 14:25.